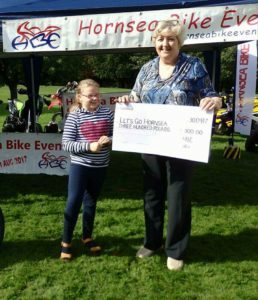 The Hornsea Bike Event held their Presentation Day in Hall Garth Park on the 30th September. They were again blessed with sunny weather. The winning raffle ticket for the Suzuki 250 Café Racer, was bought by Steve Herron from Birstall near Batley. He shared the prize with his girlfriend’s father Nigel Charlesworth, who lives in Hornsea. 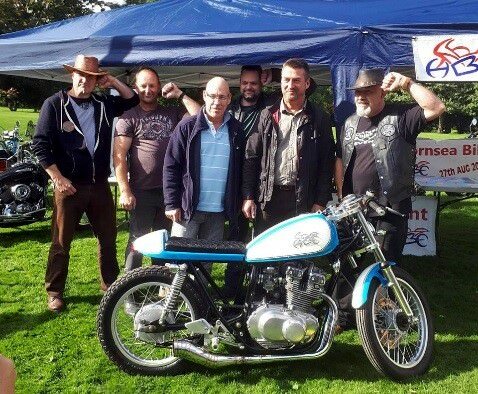 They posed for a photo with members of the Ribbon of Black Motorcycle Rally Club; who rebuilt the bike, then presented it to the Hornsea Bike Event. Aim Higher is a charity that supports parents with autistic children. 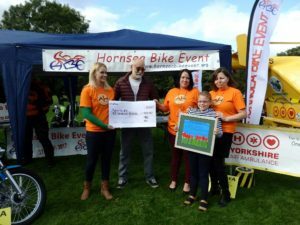 With the logistical help of the Hornsea Bike Event committee, Aim Higher organised a family fun day on the Saturday before the Bike Event. HBE took care of all the insurances, licences and marquee hire etc, for that day; allowing AH to raise over £500 from their fun day. HBE donated another £500; which took the AH total to just over a £1000. AH were presented with their cheque by Phil Hargreaves from the Art Society, who had organised and judged the children’s art competition. Alisha Bielby age 8 who painted the overall winner of the art competition presented a cheque to Jan Harris from Let’s Go Hornsea. Aisha’s picture will now be reproduced on the sea wall. 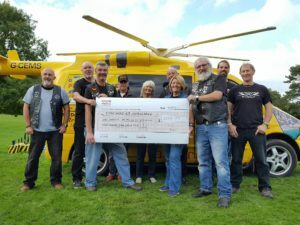 The Hornsea Bike Event committee presented the Yorkshire Air Ambulance staff with a cheque for £3,330. This total amount was comprised of the HBE donation of £2500, and the money raised by YAA’s merchandise stall and collection. Bikes Against Bullies is a charity that gives help and support to families with children suffering from bullying. 1.5 million children are bullied every year with a third of them going on to suffer some form of mental illness in later life. They can liaise with schools, offer counselling and give a ride out to the bullied children. 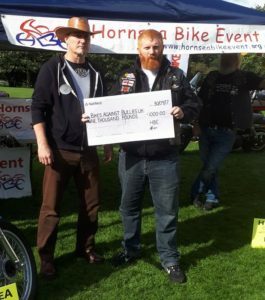 Chris Cooper, the Chair of Bikes against bullies UK received a £1000 cheque from the Hornsea Bike Event. Chris said the amount would allow them to visit more than twenty schools.